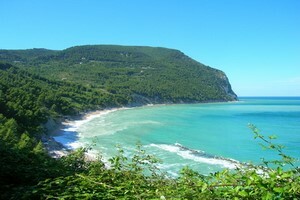 Compare prices on car hire in Ancona from all the major brands and find the best deals. When you book through us, unlimited mileage and insurance are always included in the price given. Ancona is a city in Central Italy in the Marche region on the Adriatic Sea. The port city has a population of 100,000. There are ferry services to the Croatian Zadar , Split , Hvar, Bari, Rijeka and Dubrovnik , and to Greece and Montenegro. Trajan’s triumphal arch from the year 115 AD Kr. is in Ancona. It is made of marble. This is also the cathedral of San Ciriaco 1000-century, built on the ruins of a temple of Venus. Ancona Cathedral stands on a hill, Guasco, overlooking the harbor and spectacular views of Ancona and the Adriatic coast. It is shaped like a boat that is upside down, and has a 12-sided dome. At Ancona harbor stands a monument that was built by Benito Mussolini. In Monte Conero in the vicinity there is a coastline with many sandy beaches and resorts that Portonovo, Sirolo and Santa Maria di Badia. Aeroporto di Ancona Falconara is 4 kilometers outside the center of Ancona.